We currently have a total accommodation of 22 rooms. Rooms are large and very comfortable. Each room is fully air conditioned with a private toilet and bath, hot and cold water, hotel-standard beds, access to a private balcony (for select rooms), and a beautiful view of our gardens. Upon arrival, kindly take note of our House Rules, posted on the wall by the door to your room. Check-in time is 2:00 PM; if you wish to arrive earlier, you may of course do so and wait for the availability of your room in any one of our beachfront huts. Our staff will hold your luggage for safekeeping. All rooms can accommodate 1 extra person. Extra person rate is PHP 950 / person (without breakfast). Children ages 3 and below are free, 4 to 8 are half-rate, and 9 and above are regular rate. 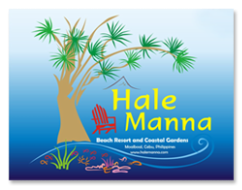 Room rates include free use of swimming pool and sea amenities such as kayaking, snorkeling, use of life vests, beach shoes and trips to our floating raft with assistance at all times by our Hale Manna staff. We accept Credit and Debit Card Visa and Mastercard payments. 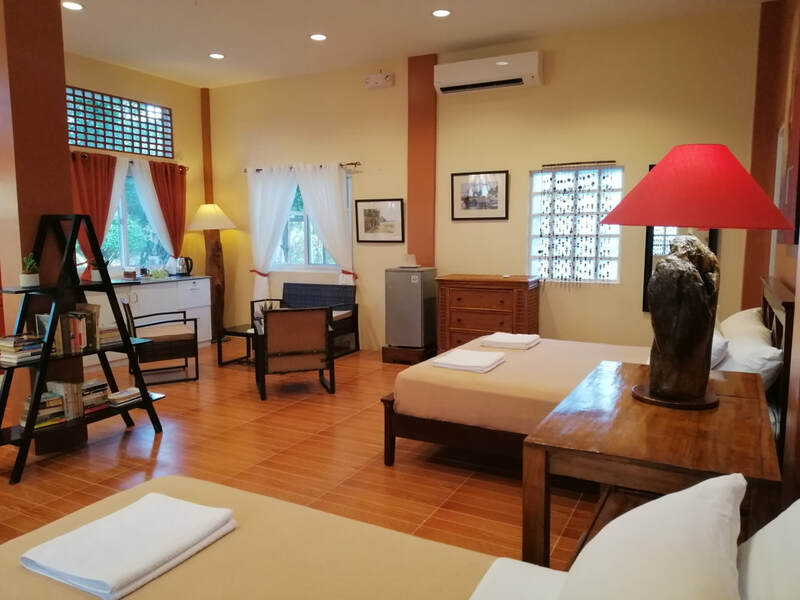 Most of the rooms have access to WiFi running on wireless 3G/4G connection as no telco landline/DSL service is available in the area. A reservation fee or downpayment of PHP 2,000 per room is required which will be deducted from the total bill upon check out. Superior room good for 1 to 3 persons, located at the ground floor with 1 double bed, 2 single beds, and own balcony. Rates are inclusive of breakfast and free use of swimming pool and sea amenities including life vests and beach shoes. 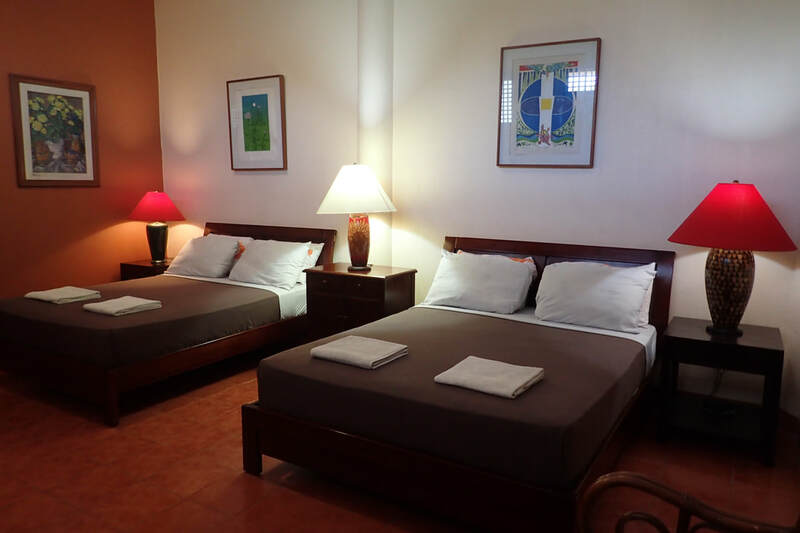 Superior room good for 1 to 3 persons, located at the second floor with a queen-sized bed, single bed, and own balcony. Rates are inclusive of breakfast and free use of swimming pool and sea amenities including life vests and beach shoes. 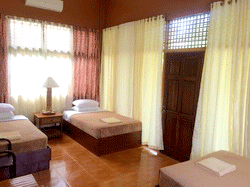 Superior room good for 1 to 3 persons, located in a separate bungalow beside Room 8 and adjoins Room 10. Room has 3 individual beds and own balcony. Rates are inclusive of breakfast and free use of swimming pool and sea amenities including life vests and beach shoes. Superior room good for 1 to 3 persons, located in a separate bungalow beside Room 8 and adjoins Room 9. Room has 3 individual beds and own balcony. Rates are inclusive of breakfast and free use of swimming pool and sea amenities including life vests and beach shoes. Jade room is a superior room good for 1 to 3 persons located at the ground floor of the Sarmago House that overlooks the swimming pool. Room has one queen sized bed and one single bed and own balcony. Room is equipped with a refrigerator. Rates are inclusive of breakfast and free use of swimming pool and sea amenities. Coral room is a superior room good for 1 to 3 persons located at the ground floor of the Sarmago House that overlooks the swimming pool. Room has one queen sized bed and one single bed and own balcony. Room is equipped with a refrigerator. Rates are inclusive of breakfast and free use of swimming pool and sea amenities. Gold room is a superior room good for 1 to 3 persons located at the ground floor of the Sarmago House that overlooks the swimming pool. Room has one queen sized bed and one single bed and own balcony. Room is equipped with a refrigerator. Rates are inclusive of breakfast and free use of swimming pool and sea amenities. Spacious room for 2-6 people enjoying sea and garden views. With 2 queen size and 2 single beds, ensuite bathroom, living area, desk, mini refrigerator, and large private balcony. Spacious second-floor room for 2-6 people enjoying sea and garden views. With 2 queen size and 2 single beds, ensuite bathroom, living area, desk, mini refrigerator, and large private balcony. The Honeymoon suite is good for 2 persons located at the second floor of the newly constructed Sarmago House with scenic views and overlooks the swimming pool. Room has one king sized bed, and is equipped with high definition TV, refrigerator, and has access to a large open and covered lanai. Rate is inclusive of breakfast and free use of swimming pool and sea amenities. 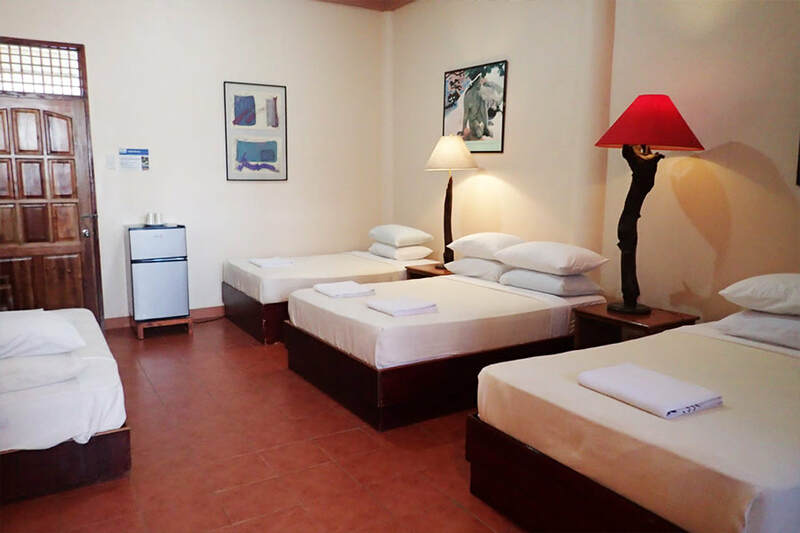 Family room good for 4 persons, located at the second floor with 1 double bed, 2 single beds, and one daybed. Room has access to upstairs living room and large common balcony. Rates includes free use of swimming pool and sea amenities including life vests and beach shoes. 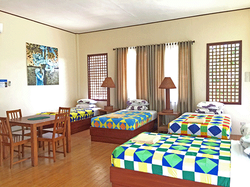 Family room good for 5 persons, located at the second floor with 1 double bed, and 4 single beds. 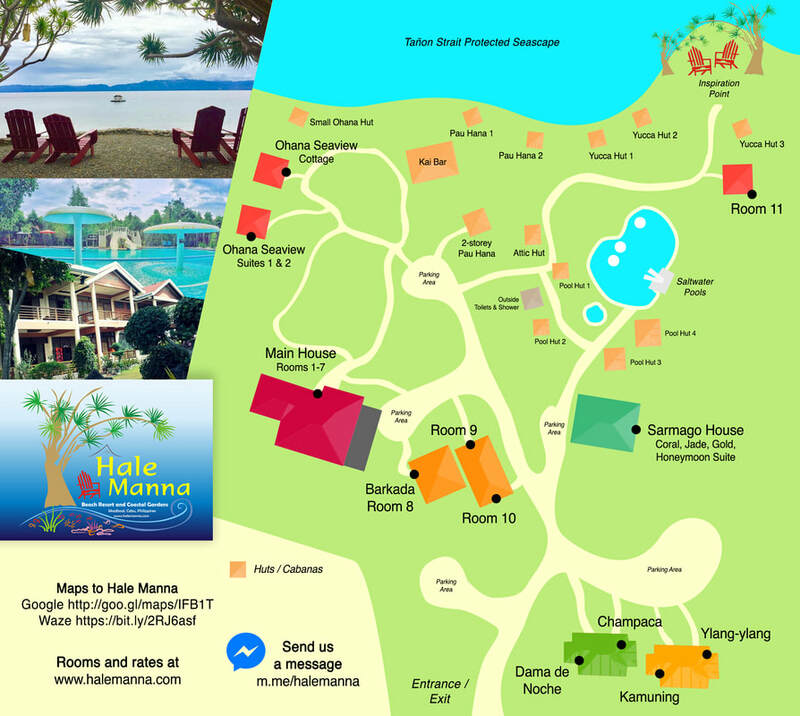 Rates includes free use of swimming pool and sea amenities including life vests and beach shoes. Deluxe Room good for 4 persons, located at the second floor with 2 queen-sized beds and a daybed. Rates includes free use of swimming pool and sea amenities including life vests and beach shoes. 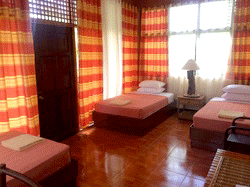 A duplex room good for 6 persons, located a distance from the main house but inside the Hale Manna compound. 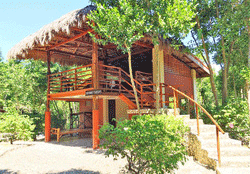 It is adjacent to Ylang-ylang room, and beside the Champaca & Dama de Noche rooms. Ideal for families and groups bringing or wanting to cook their own food. 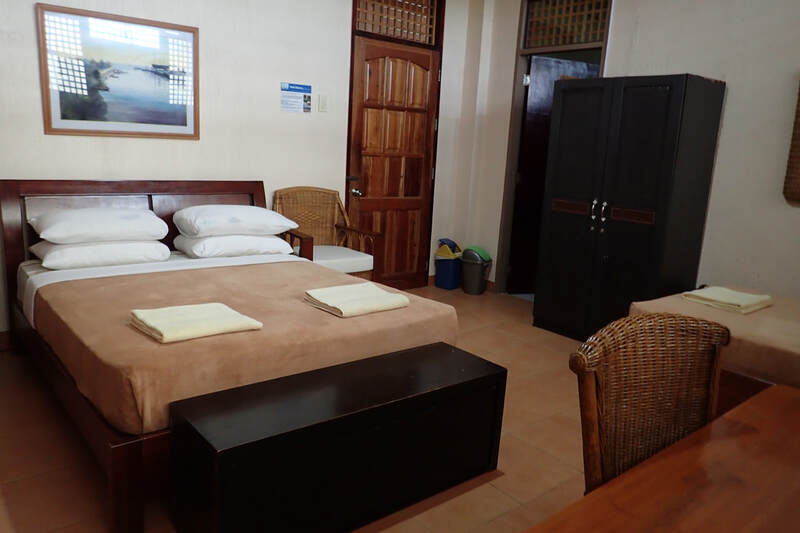 Kamuning room has kitchen with stove and refrigerator, rice cooker, cooking pots/pans and dining utensils, air-conditioned, own toilet and bath, with one queen sized bed and three double beds. 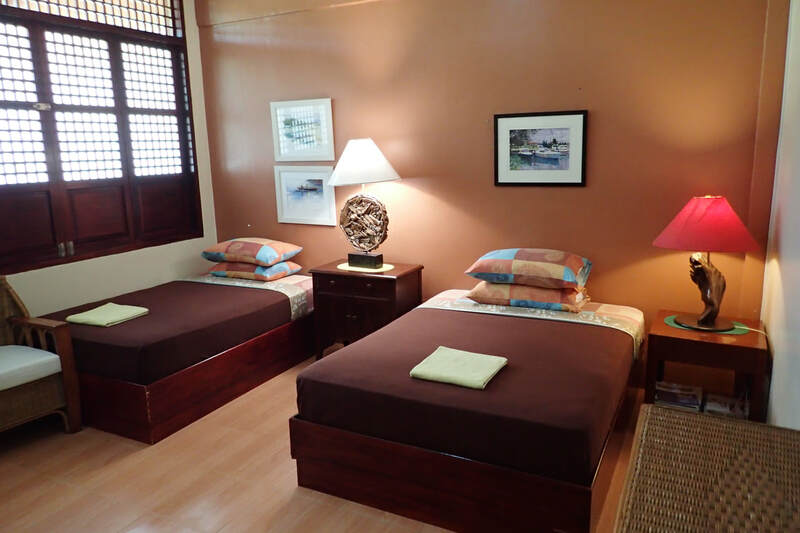 A duplex room good for 6 persons, located a distance from the main house but inside the Hale Manna compound. 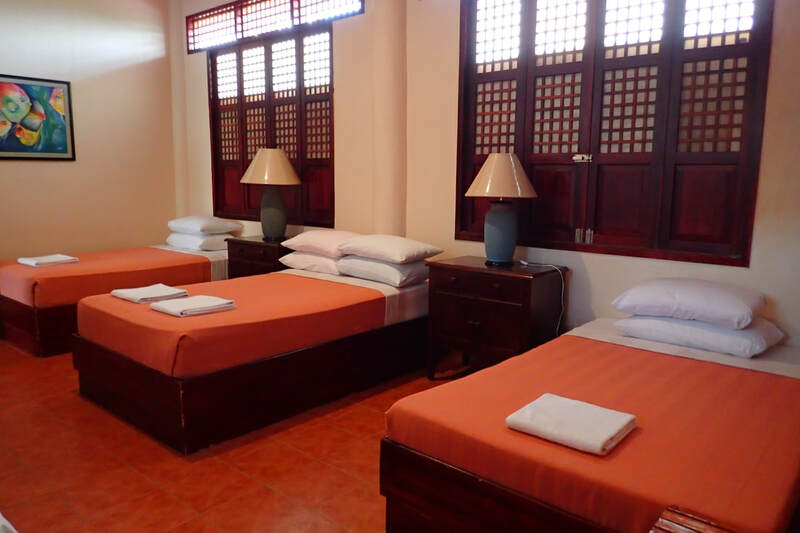 It is adjacent to Kamuning room, and beside the Champaca & Dama de Noche rooms. Ideal for families and groups bringing or wanting to cook their own food. 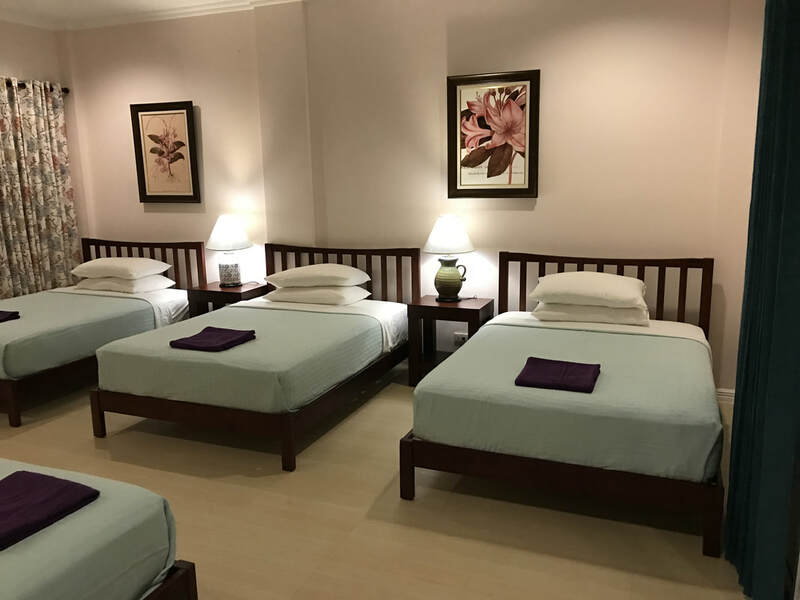 Ylang-ylang room has kitchen with stove and refrigerator, rice cooker, cooking pots/pans and dining utensils, air-conditioned, own toilet and bath, with one queen sized bed and three double beds. 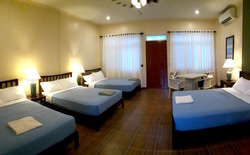 One of two newly constructed duplex rooms good for 6 persons, located a distance from the main house but inside the Hale Manna compound, adjacent to Champaca, and beside the Ylang-ylang and Kamuning Rooms. Ideal for families and groups bringing or wanting to cook their own food. 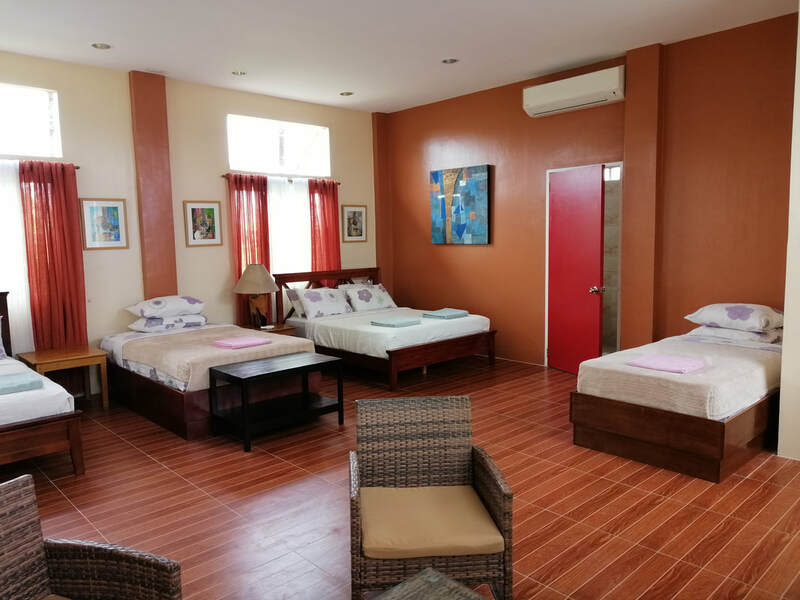 Dama de Noche room has a kitchen with stove and refrigerator, rice cooker, cooking pots/pans and dining utensils, air-conditioned, own toilet and bath, with one queen sized bed and three double beds. 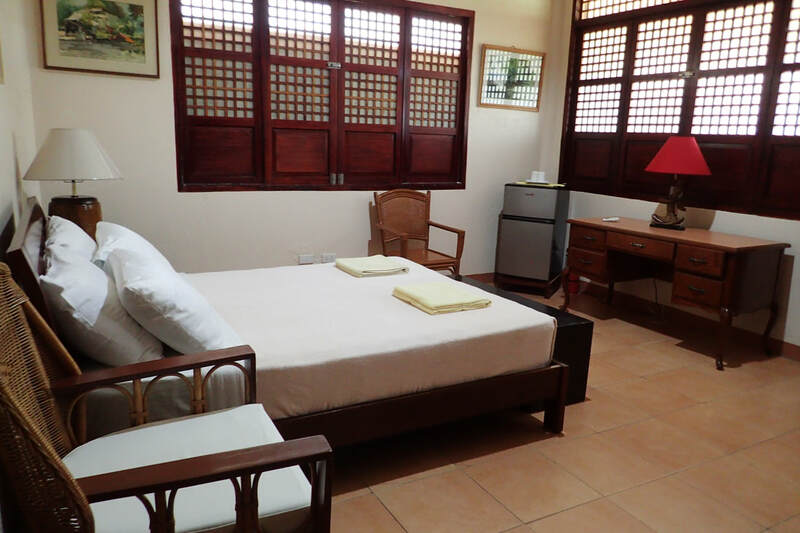 One of two newly constructed duplex rooms good for 6 persons, located a distance from the main house but inside the Hale Manna compound, adjacent to Dama de Noche, and beside the Ylang-ylang and Kamuning Rooms. Ideal for families and groups bringing or wanting to cook their own food. 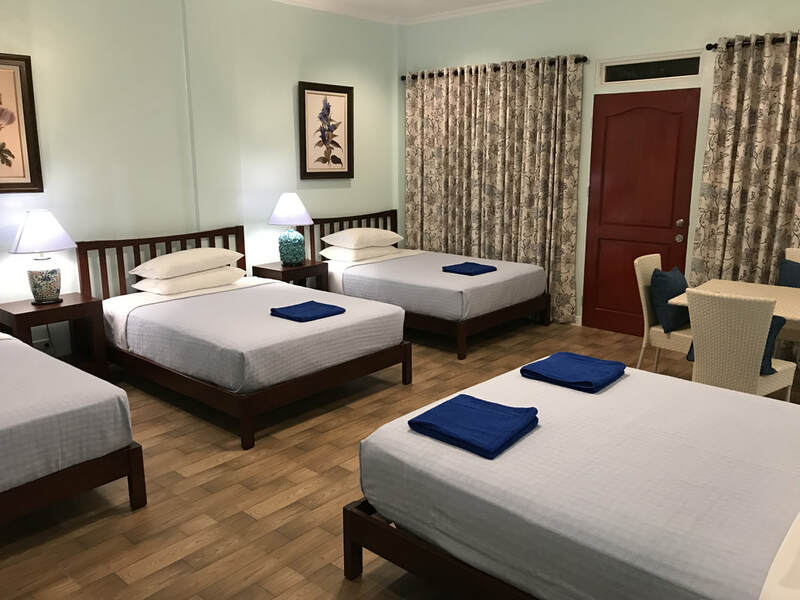 Champaca room has a kitchen with stove and refrigerator, rice cooker, cooking pots/pans and dining utensils, air-conditioned, own toilet and bath, with one queen sized bed and three double beds. 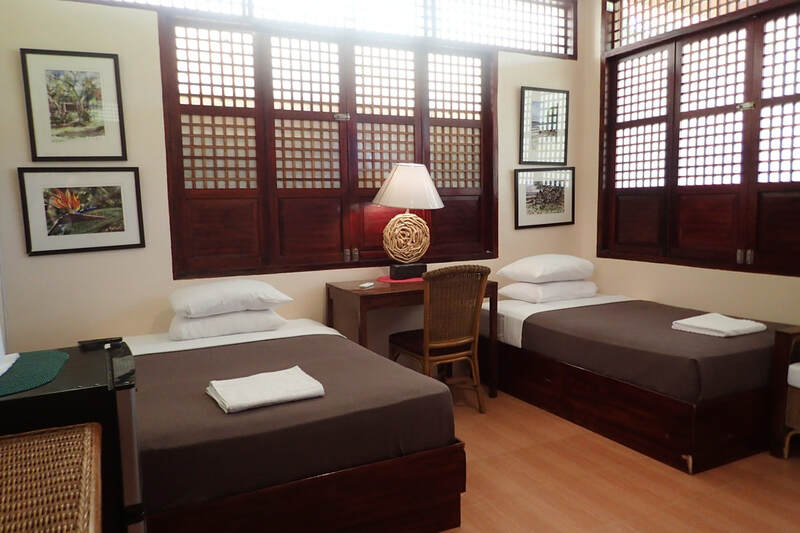 The Barkada Room, good for 8 persons, is located in a separate bungalow beside the main house with 8 individual beds and own balcony. Rates include free use of swimming pool and sea amenities including life vests and beach shoes. A 2-storey family room good for 7 persons that has both ocean and garden views. 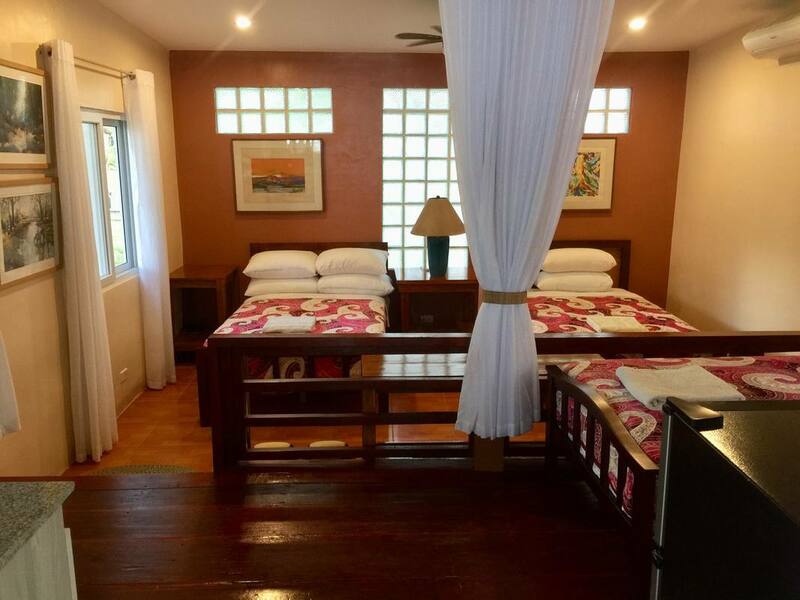 Downstairs bedroom is air-conditioned, has 1 double bed, 1 single bed, and own toilet and bath, while second floor is an attic-like bedroom with camping like sleeping arrangements and is also fully air-conditioned. Rate is inclusive of free use of swimming pool and sea amenities including life vests and beach shoes.